If you are a regular reader here, you will know that the Ronald McDonald House Charities has a big place in our hearts. When Faith was born, 4 years ago (oh my how time flies!! ), we spent 2 weeks at the Ronald McDonald House in Hamilton. This is an amazing thing that McDonalds provides for families with children who are sick, and takes the worry off surrounding the families decisions to be able to stay closeby without having to break the bank. It was such a comfortable place to stay and was so welcoming to us and our older children too. And in the news last week, was the opening of the Ronalld McDonald House in Toronto! That was exciting to hear, knowing that the hospitals in Toronto are always so full of families who just need a place to call home when their children are in the hospital for treatments. Overview: Show you care with a share! 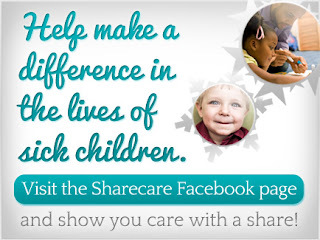 Sharecare is happy to support the Ronald McDonald House Charities®this holiday season by providing a donation to help continue care given to families and children who are battling illness. 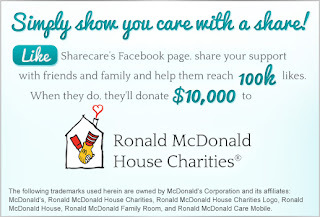 Visit http://www.facebook.com/SharecareNowand Like our page to help support the Ronald McDonald House charities! Facebook Rules – If Sharecare Receives 100,000 LIKES on their Facebook page, Sharecare will donate $10,000 to Ronald McDonald House Charities. Check back for Like Campaign progress. Limit one LIKE per Facebook account. The program will begin at 12:01 AM ET 12/12/11 and ends at 11:59 PM ET 12/31/11 or until the goal of 100,000 LIKES is reached. Ronald McDonald House Charities will receive a minimum donation of $5,000. Must be a registered Facebook user to participate. This application is published by Sharecare, which is solely responsible for its content. This program is in no way sponsored, endorsed or administered by Facebook. No purchase necessary. Void where prohibited. Disclaimer: I have not been compensated for writing this post. The only thing I receive is knowing that an amazing Charity, that I know helps so many families, is benefitting in the end! !